Balantidium coli lives in the cecum and colon of humans, pigs, rats and other mammals. It is not readily transmissible from one species of host to another because it requires a period of time to adjust to the symbiotic flora of the new host. 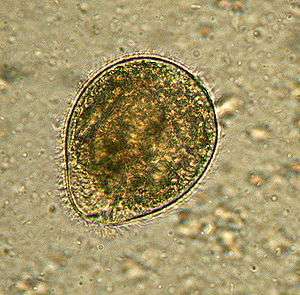 Once it has adapted to a host mortality, the protozoan can become a serious pathogen, especially in humans. mortality multiply and encyst due to the dehydration of feces. Infection occurs when the cysts are ingested, usually through contaminated food or water. Balantidium infection in immunocompetent individuals is not unheard of, but it rarely causes serious disease of the gastrointestinal tract. It can thrive in the gastrointestinal tract as long as there is a balance between the protozoan and the host without causing dysenteric symptoms. Infection most likely occurs in people with malnutrition due to the low stomach acidity or people with compromised immune systems. 1 2 Ramachandran, Ambili (23 May 2003). "Introduction". The Parasite: Balantidium coli The Disease: Balantidiasis. ParaSite. Stanford University. 1 2 3 4 Schister, Frederick L. and Lynn Ramirez-Avila (October 2008). "Current World Status of Balantidium coli". Clinical Microbiology Review. 21 (4): 626–638. doi:10.1128/CMR.00021-08. PMC 2570149 . PMID 18854484. 1 2 3 4 5 Roberts, Larry S.; Janovy, Jr., John (2009). Foundations of Parasitology (8th ed.). McGraw-Hill. pp. 176–7. ISBN 978-0-07-302827-9.